Only one serious error can be pointed out in Hartford Stage's production of "The 39 Steps" - the ending. No, not the ending of the play, but the curtain call bowing. The cast of four are divided, two then the other two, receiving audience applause. Each member of the quartet deserves equal, and huge, credit. That being said, the play itself is an extremely clever combination of movie elements from Alfred Hitchcock mysteries (the play is based on his movie of the same name), to 1940's film noir, to Keystone Cops, and Monty Python. Throw in a spy, a corpse, a mansion and it's a flick. In fact, some audience members at Hartford Stage are seated as if watching a movie within a play. There's the handsome run-away hero (with pencil mustache), the double roled femme fatale/woman on the train, and all the rest. The latter meaning two actors take on the incredibly difficult task of portraying dozens of characters each, changing costumes and sexes with split second timing. Director Maxwell Williams, along with his scenic designer, lighting and sound team, not to mention backstage dressers, is due equal kudos to those onstage. A rather disheveled odd looking set with a stack of motley props becomes numerous indoor and outdoor scenes - sometimes both at the same time. One prop morphs from a waterfall into a train. The train chase is the most creative and funniest moment in the play. While the characters take themselves very seriously, the humor is displayed through their movements. 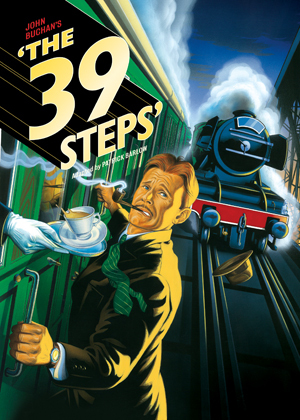 Dialogue alone would not make "The 39 Steps" a comedy, which is probably why Hitchcock knew it worked as a dark mystery. Robert Eli portrays our matinee hero with spot-on aplomb and a feigned sophisticated demeanor. For most of the play, Christina Pumariega depicts a damsel in distress who underplays her role to help the other cast members receive the laughs. Noble Shropshire and Steve French are "the other cast members." Versatile, malleable, physical, and quick, with accents to fit each separate role, these two take the play from funny to hysterical.